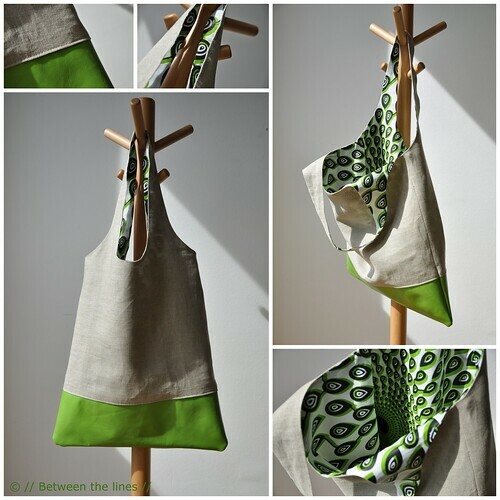 This is what I've worked on last Thursday - another shopping bag. I named it the GrassShopper because of all the green. A bit lame, I know! And I admit, the green leather is really, well uhm, green. Quite different from the shades of brown and grey you usually get to see here. But it suits the season, I thought. I saw this green leather a while back at BHV here in Paris. I didn't buy it at first, went back a couple of times and then last week I finally gave in. I shouldn't have waited much longer as they only had a couple of pieces left. I still have enough leather for at least one more bag like this, and I have something in mind for the scraps as well. For the lining I found some really nice coated cotton with a graphic print. Also, this was the first time my sewing machine behaved really well, or maybe it's just me. I found a way around most of the problems I previously had when sewing leather. I might list them at some point when I further have perfected 'my skill'. Now, what will I do with all those bags, you say. I'm not sure if there still would be any interest for these in the already saturated market of bags and totes, but ideally, I'd like to start selling them. I still need to figure out how, when and where. I'll keep you posted, I promise! But for now, I'm wishing you a great week!